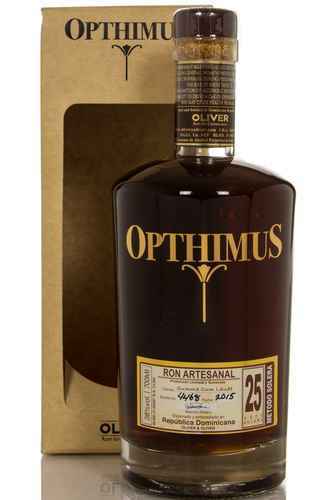 Opthimus Rum is bottled by the Oliver y Oliver company, who operate rather like a whisky independent bottler. Having first entered the world of rum 20 years ago, they made the choice not to create their own spirit, but to select only the very best of available Caribbean rums and bottle them under their Opthimus brand. Opthimus buy both rum and new make spirit from the very best distilleries from around the Caribbean and South America, including distilleries in Nicaragua, Guatemala, the Dominican Republic, Trinidad and Tobago and Panama, amongst several others. Oliver y Oliver then take these spirits, age them in bourbon and Temperanillo casks in a solera system. They also operate a finishing process, much like that used in whisky, for their “Special Finish” series, whereby the spirit undergoes an additional 6 months of aging in a former sherry, port or malt whisky. The company is based in the Dominican Republic, in the Hato Nuevo valley region of Santo Domingo. The company is named after Pedro Ramon Lopez Oliver, their founder, who is a descendent of Juanillo Oliver, a Catalan distiller who moved to Cuba in the mid-1800s. Whilst the family had long since stopped distilling and left Cuba, Pedro was determined to revived the old family business, something he achieved with Oliver y Oliver and Opthimus Rum. To do so, Pedro brought distillers and rum experts over from Cuba to the Dominican Republic, so he could learn the traditional Cuban way of maturing rum. Despite its short history, Opthimus has picked up a wealth of awards, with their 25 year old offering winning double gold at the 2015 San Francisco World Spirits Competition. Meanwhile, their 25 year old Malt Whisky finish received the same award, and was a finalist in the Ultimate Spirits Challenge, receiving a huge 96 points out of 100. Drinkers of Opthimus Rum should expect a mahogany coloured rum, with notes of toffee, caramel, burnt sugar and touches of light, creamy nuttiness. 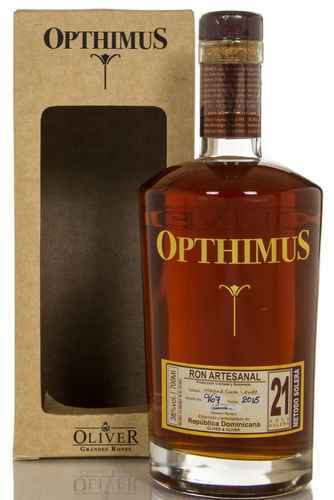 That said, Opthimus have become renowned for their usage of unusual cask finishes, so you can expect bottlings like the port finish to lend notes of red fruit, the malt whisky finish will grant notes of cereal sweetness whilst the sherry finish adds notes of dried fruit.